Most Chromeboxes comes with the option of a Chrome OS keyboard, and every Chromebase comes with a wired keyboard and mouse. ChromeOS keyboard are a little different key setup then typical PC keyboards (you can still use a standard PC keyboard with ChromeOS). Most users first notice that their Chromebook keyboard does not have a Caps Lock key and is instead replaced with a search button. This is the biggest difference between a Chromebook keyboard and a standard PC keyboard (users will also notice this with a Chromebase keyboard and Chromebit keyboards as well). You can still use caps lock on your Chromebook though! To enable or disable caps lock on your Chromebook press: alt + search. You can also set the search key function permanently to function as caps lock, ctrl, alt, escape, or even disable it all together. To change the function visit your Chromebook’s settings page (chrome://settings) and click Keyboard Settings. 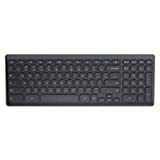 There are several Chrome OS specific keyboards you can buy separately: The wired Dell Chrome keyboard and the wireless ASUS Chrome Keyboard & Mouse are the most popular. As Chromeboxes and Chromebases grow in popularity, there will presumably be more ChromeOS centered keyboards in the future. For now, below are some of the best ChromeOS keyboards that you can buy. This Chrome keyboard is designed for usability and durability. The Dell ChromeOS keyboard features quiet keys with minimal spacing that helps repel dust and debris. The Chiclet keys and large typing surface allow for high productivity and comfortable usage whether on a Chromebook or Chromebase. Unlike other Chrome keyboards, this one isn’t wireless, so you will still have to deal with cables, but it’s much cheaper than its wireless competitors. The Dell Chrome keyboard has shortcut keys let you conveniently access essential Chrome OS features such as browser shortcuts and immersive and overview mode shortcuts. Additional shortcut keys include screen brightness control, volume control and a search functionality shortcut. This ChromeOS keyboard is Google-approved and is specifically designed for Chrome OS users on Dell Chrome books and Dell Chrome boxes. Overall, one of the better keyboards out there. This is an excellent Chrome OS key board for the chrome box. It is a perfect match for the Chrome box (or Chromebase or Chromebit keyboard). 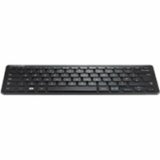 This keyboard is an original Samsung keyboard that is specifically designed for the Samsung Chromebox computer. Since it is designed specifically for the Chromebox, some of the keys are different from a ‘normal’ PC keyboard, but it works perfect with the Chromebox and any other computer on ChromeOS. The same layout is found on the Samsung Chromebook laptop computer. The size of this keyboard is slightly smaller than a ‘normal’ PC keyboard. The feel of the keys is good. It lays flatter than most keyboards. The added features that are fun to have include speaker volume control, brightness change butons, fast up and down keys that are faster than I can scroll with my fingers. 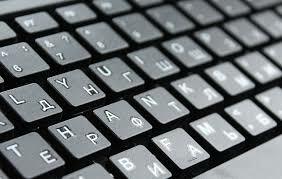 Forward and backward keys plus a dedicated search key. Also nice are keys for screen size changes that saves searching with the mouse. The ultra-thin keyboard and compact mouse are custom-made for office, home and traveling. No driver required, just plug and play, so you’re able to enjoy high convenience. The wireless mouse has intelligent power saving design. The light-sleep mode begins if without operation for 1-second, the middle-sleep mode comes if you haven’t used the wireless mouse for 60 seconds and 8-minute inactivity will initiate deep-sleep mode. Move the mouse under light and middle level sleep or press any key under deep level sleep to activate it. There are not many ChromeOS keyboards out there just made to be Chromebook or Chromebook keyboards. That is not the end of the world (The custome ChromeOS keyboards tend to be more expensive too). The biggest difference between a Chromebook keyboard and a PC keyboard are some of the keys. Most standard PC keyboards will work on Chromebooks, Chromboxes, and Chromebits. Below are some of the better keyboards to use with your ChromeOS computer (ChromeOS compatible keyboards). In this area, Logitech still reigns strongly making some of the best Chromebook keyboards out there. This is a wireless TV keyboard with touchpad that might work great on a Chromebit. Enjoy effortless control of your TV-connected computer whether it is on ChromeOS or Windows. Plug the tiny Unifying receiver into a USB port and start the fun. Use the keyboard receiver to connect up to six Unifying devices to your computer. This is one area where Logitech really shines is that they have an interface to use multiple Bluetooth devices with ChromeOS. 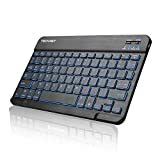 Comfortable, quiet keys and large (3.5-inch) touchpad: The ideal HTPC keyboard10-meter (33-foot): wireless range Watch video, browse the web, chat with friends and more, without annoying delays or dropouts. Multi-device Bluetooth keyboard: Universal keyboard for typing on all your computing devices. This keyboard works on ChromeOS or any Bluetooth-enabled computers or mobile devices that support external keyboards with HID profile. EasySwitch is a useful feature and you can connect up to three devices simultaneously and switch between them at the touch of button. This is a Bluetooth 3.0 ChromeOS compatible keyboard that provides a cable-free & clutter-free connection within 10 meters. The keyboard is portable and ultra-slim (less than 1/4in) design makes for easy portability. Lighter than a standard magazine, durable enough to travel. 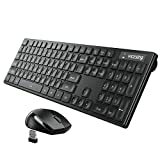 Great cheap keyboard that will serve most users will.